The Pirates have signed first overall pick Gerrit Cole, according to Jon Heyman of SI.com (on Twitter). Cole obtains an $8MM deal, according to John Manuel of Baseball America (on Twitter). 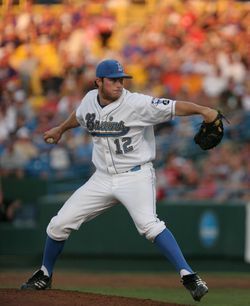 The Boras corporation represents the hard throwing UCLA product. Cole stands 6'4" and doesn't turn 21 until the fall. He throws a slider and change-up, plus a fastball that regularly reaches the mid 90s. However, his stuff didn’t translate into the statistical success you’d expect for a first overall pick (teammate Trevor Bauer posted more impressive numbers). Cole finished the season with a 3.31 ERA, 119 strikeouts and 24 walks in 114 1/3 innings – impressive numbers, but certainly not Strasburg-esque. Cole has experience as a first rounder. The Yankees selected him out of high school in 2008. He declined to sign, even though he’s a Yankees fan who counts Roger Clemens and Mariano Rivera among his role models. I spoke to Cole earlier this year; here's my interview transcript. You can keep track of which top picks have signed with MLBTR's list.